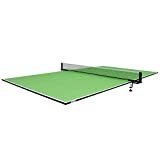 Sometimes, you may not have sufficient space to purchase a full table tennis table or perhaps you may not want to exclusively be playing table tennis alone at all times given that there are quite a few different table top games that you could be playing. 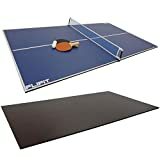 You may therefore want to opt for table tennis tops instead, in which case, you will want to know which variety is highly rated by previews buyers. 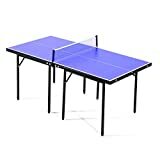 Below is a list of best selling table tennis tops that you might want to get for your gaming needs. With folding design, it is easy to assemble and store when not in use. Table tennis table conversion top for your pool, snooker or dining table. Two-piece convertible 8-foot top for easy removal and storage. Foam-coated underside to protect your pool table. Free net and post set with clamps included. Free accessories - bats and balls included. Two-piece convertible 7-foot top for easy removal and storage. Comes with free accessories - quality ping-pong bats and balls. Instantly convert your pool table, dining table or other flat surface into a table tennis table. Two-piece 9-foot collapsible top for easy removal and storage. Foam-coated underside to protect your table. Net and post set with clamps included. Two free bats and balls included. 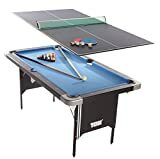 Two games in one - folding pool table & table tennis top! Play pool or table tennis whenever you like! Great games for kids at home. Free accessories include table tennis net, posts & bats, and pool cues & balls.